Got a tip that Sushi Dokku opened for friends and family Monday evening. I called, and sure enough the hostess who answered the phone invited me to "come on in" to check it out even though the restaurant wasn't officially opening until Jan. 15. Sushi Dokku's arrival is exciting because it's from Susan Thompson and Angela Hepler-Lee—two-thirds of the former owners of the now-shuttered Sushi Wabi. If you remember, there was a ton of drama surrounding that closing. Anyway, the new restaurant is directly across the street from the old venue, and regulars of Sushi Wabi should be happy to see some of the old menu standbys. New to the menu are what they're calling "dressed nigiri bites," which will be accompanied by garnishes and sauces. 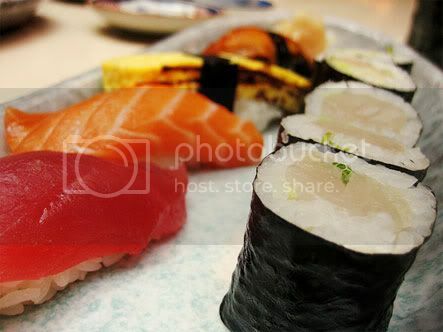 Expect also typical maki rolls, hot and cold Japanese dishes, and a small ramen menu. Here are some photos of Sushi Dokku's menus. Yeah, you're going to have to squint a bit! Everyone Wants A Piece Of The Great Lake Pie! "I live around the corner from Great Lake and ever since the word got out they were not resigning their lease—the line has been insane. This was at 5pm this past Sat. night, it wrapped around all the way to the alley!" We still have no idea which teams will square off in the Super Bowl when it kicks off at 4pm on Feb. 3, but at least there's Beyoncé. She's certain to rock out at the 50-yard line. You can be a star on Super Bowl Sunday too—if you whip up the best snacks for your guests during your fantastic fete on football's biggest day. Public House Executive Chef David Blonsky's gives us the recipe for his mini Kobe corn dogs, which should certainly make your case for MVP.